.. I am interested in volunteering, please contact me. Thank you for your support! 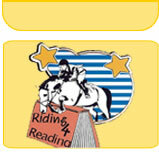 Riding for Reading is a non-profit 501 C (3) organization.